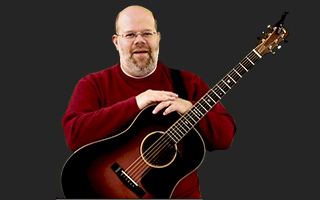 In this lesson Steve teaches a Bluegrass version of the classic gospel song "Will the Circle Be Unbroken." He teaches the chords, strumming pattern, walking bass lines, and the melody. I though this lesson was great. I am just doing a free trail and I am glad that it is if fun song I can lean quickly. Hope to watch more jam play videos like this one. Very impressive because it is adaptable for anyone from a beginner to someone like me who wants to learn todo more walkups and diddles (embelishments). Thanks for making it so visual. I LOVE visual teaching!!! In scene 4 re the hammer ons, I can do it pretty well but I can't get the up/down strum that comes AFTER the pull-off to sound right. Too many notes ringing out. Steve, can you help? i'am having problems printing the verse/chorus. i'am only getting part of the page can anyone help. Which specific items on the supplemental content menu are you trying to print (be specific). Email me [email protected] and I will see what I can do.